This dataset contains information about hospitals in England. National Health Service (NHS) Choices considers hospitals as locations that provide predominantly inpatient services. It includes information about organization and post codes, telephone number and email address for several hospital organizations in England. 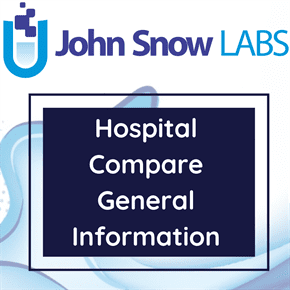 This dataset contains address details and contact information about different hospitals. Hospitals are sourced from Organisation Data Service (ODS), which is part of the Health & Social Care Information Centre (HSCIC). NHS Choices has provided the functionality that allows hospitals to access their profiles using the Provider Information Management System (PIMS) to update the information NHS Choices holds about them. Hospitals or their parent organizations that have taken up this privilege are able to update their respective profiles. Hospitals are identified by an ODS code in addition to an NHS choice internal identifier. In England, hospital services are commissioned by clinical commissioning groups (CCGs). Hospitals themselves are mostly managed by NHS trusts, which ensure high-quality care is provided and that money is spent efficiently. If hospitals or trusts provide poor quality of care, then they could be put into special measures. Trusts in special measures are expected to have made improvements within 12 months. Healthcare in England is mainly provided by England’s public health service, the National Health Service, that provides healthcare to all permanent residents of the United Kingdom that is free at the point of use and paid for from general taxation. Since health is a devolved matter, there are differences with the provisions for healthcare elsewhere in the United Kingdom. Though the public system dominates healthcare provision in England, private healthcare and a wide variety of alternative and complementary treatments are available for those willing to pay. The National Health Service (NHS) is free at the point of use for the patient though there are charges associated with eye tests, dental care, prescriptions, and many aspects of personal care. The NHS provides the majority of healthcare in England, including primary care, in-patient care, long-term healthcare, ophthalmology and dentistry. The NHS has recently adopted a formal constitution which for the first time, in one document, lays down the objectives of the NHS, the rights and responsibilities of the various parties (patients, staff, trust boards) and the guiding principles which govern the service. England has a private sector in health care providing a lesser set of treatments than those obtainable from the NHS. Private healthcare is sometimes funded by employers through medical insurance as part of a benefits package to employees though it is mostly the larger companies that do. Insurers also market policies directly to the public. The private sector now does some subcontracting work for the NHS. Thus an NHS patient can be treated in the private sector as an NHS patient if the Health Services has subcontracted work to the hospital.